We began our day by taking advantage of the indoor pool, as it was still pretty chilly outside, but next time we return to the DoubleTree Resort By Hilton Myrtle Beach Oceanfront the lazy rivers will definely be on our priority list! While my ideal beach vacation is lounging by the pool or ocean drinking tropical drinks all day long, when you are parent that changes completely. Nonetheless, I am okay with that, because the places I end up taking Joaquín are usually new to me and since I am a curious person I love learning new things — especially through his eyes, which make the most mundane things seem magical. So, off to Ripley’s Aquarium of Myrtle Beach we went! Ever since Joaquín was little, he has been fascinated with aquariums. Thus, whenever we travel, we seek out local aquariums. Ripley’s Aquariums are known for having amazing exhibitions and hands-on experiences. Plus, they do a lot for ocean conservation. I highly recommend checking out their website to see just how much they offer! 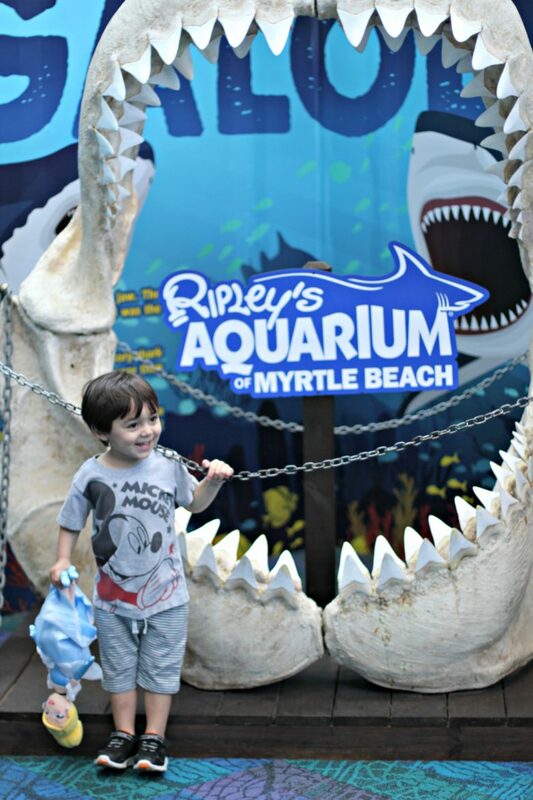 Ripley’s Aquarium happens to be located at one of the best spots in Myrtle Beach: Broadway at the Beach. I cannot tell you how much time in my life has been spent here. One of my favorite stores there is Kilwins. They have the best, and I mean best, chocolate. It is so good that Joaquín, who normally hates anything sweet, was in heaven. Kilwins is a place where people celebrate vacation and share the experience of life, family, and gifting in a very special nostalgic Americana setting. You can definitely expect warm friendly customer service there. I am a firm believer that “slow travel” is the best way to travel, epecially when you are with children. If you try to do too much in one day, children are easily overstimulated. While, I would have loved to have wandered around Broadway at the Beach, I could tell my son was done for the day. If you are, however, looking for more things to do and see while you are there, I strongly recommend checking out Visit Myrtle Beach. You will find everything you could possibly want to do while vacationing in Myrtle Beach, South Carolina, as well as more information about Broadway at the Beach. My philosophy in life after becoming a Mom is that if I unable to do something now, that just means I will get to do it later!